Located on Thailand’s western edge, Phuket serves as a gateway to the blue seas and white-sand beaches of the Thai Islands. From a base on this well-developed island, here are the best day trips by boat for sun, sand, and sea. 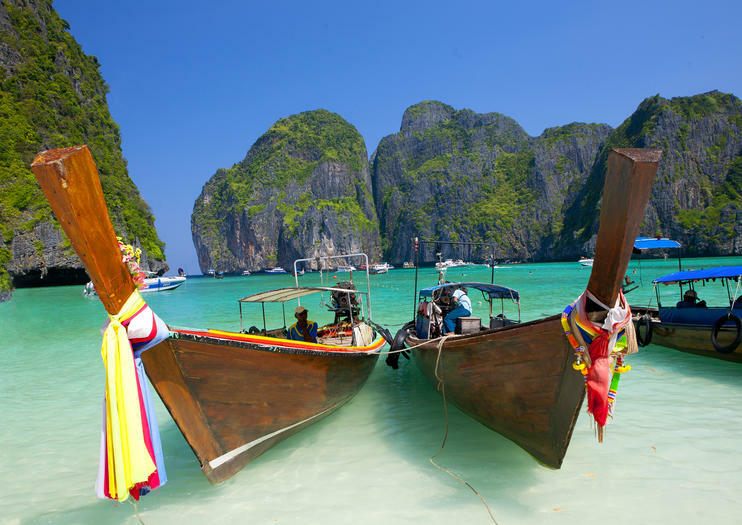 If you’ve ever seen the movie The Beach with Leonardo DiCaprio, you’re already familiar with Koh Phi Phi, an island with some of the most beautiful beaches on the planet. Take an express ferry from Phuket to Koh Phi Phi to explore the beach and go swimming or snorkeling among the colorful corals. Limestone karsts and turquoise waters teeming with life have made Phang Nga Bay one of the most popular destinations in the Thai Islands. Spend the day kayaking and snorkeling in the waters of Ao Phang Nga National Park or board a traditional Chinese junk boat for a lunch cruise past the breathtaking rock formations. Famous James Bond Island (Khao Phing Kan) gained international attention when it appeared in the 1974 James Bond flick The Man with the Golden Gun. To see this sheer limestone karst jutting from the emerald green water, take a James Bond–themed boat tour or sunset dinner cruise. Scuba divers and snorkelers from around the globe come to Similan Islands National Park to experience the clear waters and fish-filled corals of this tropical paradise. Snorkeling tours by speedboat typically include multiple swimming stops, as well as time to relax on one of the archipelago’s white-sand beaches.